An unprecedented insight into the grim brutality of the Russian revolution and the terror of the Cold War. On a midsummer day in 1937, the young Commissar Boris Bibikov kissed his two daughters goodbye and disappeared into the official Packard waiting outside. It was the last time his family ever saw him. Arrested by Stalin’s secret police, the loyal Party man confessed to a grotesque series of crimes against the Revolution. His wife, an Enemy of the People by association, was sent to the gulag, leaving the young Lyudmila and Lenina alone to face separation in a world turned suddenly cold. Lyudmila grew up a fighter, and when she fell in love with a tall young foreigner in Moscow at the height of the Cold War, she knew there would be further battles ahead. 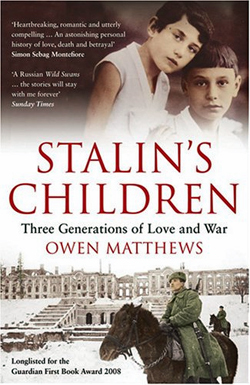 Naively infatuated with Russia, Mervyn Matthews had embarked on a dangerous flirtation with the KGB. But when finally asked to work for the organisation, he refused. Revenge came quickly: Mervyn was thrown out of the country; Lyudmila lost her job. For six years, stranded on opposite sides of the ideological divide that shaped their generation, they kept their love alive in a daily stream of letters – some anguished, some funny, but all suffused with a hope that they would eventually be reunited.